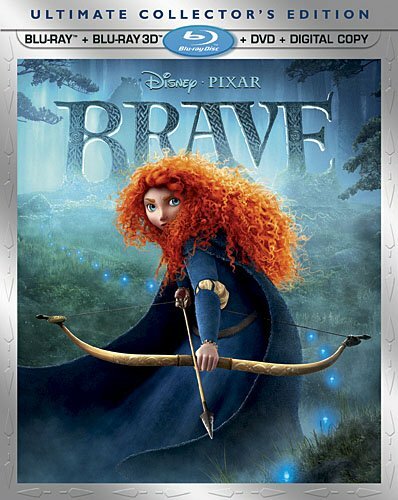 Brave may have been released on Blu-ray and DVD a couple months ago, but it's a cool computer animated feature film that deserves to have at least a short review. There is a lot to like here, wonderful art and animation, interesting and funny characters, excellent voice acting, nice pacing and action, and a fairy tale story that feels both common and new. I think it's a movie that works well for all ages, and not really like Shrek where there are jokes that go over kids head but that adults get, but just because it's an entertaining story with fun characters. The main character is Merida, an independent teenage Scottish princess who just learns that, do to tradition, she is to be married. Needless to say, she is a little peeved, but her mother, takes her kingdom's traditions very seriously. Thus, a contest is held, the winner of which will "win the fair maiden". Merida, being the young independent woman that she is, shakes things up by not only entering the contest, but winning it. This causes a huge argument between Merida and her mother, the result of which finds Merida running away. And this is where things take a turn for the worse, as Merida encounters a mysterious old witch that helps Merida change her destiny. I don't want to give the whole story away so I'll stop there, but I would like to say that I was really glad there was no romantic subplot here. This is a story about a mother and daughter and not a prince and a princess. I also love the fact that the witch is not evil, not in the slightest. She's actually a funny old lady which was extremely hesitant to even admit she was a witch. I already mentioned that the art and animation were wonderful, but I especially love the hair on Merida. It's red a curly and fluffy and just looks wonderful in motion. It's amazing how for computer animation has come, they can actually make complicated hair looks photo-realistic. But it's not just the hair, the entire movie was just a visual delight! I know it's been out for a couple months so most of you have probably seen it by now, but if you haven't checked it out yet I would highly recommend it.